Produktinformationen "18s ND3A 8 Ohm"
The ND3A 1.4 inch exit neodymium high frequency compression driver has been designed for high level sound systems application. The unit has been developed to fulfill tight geometrical requirements, thanks to its ultra compact 109mm overall diameter. The diaphragm assembly is composed by an aluminum dome sandwiched to a proprietary treated PEN (polyethylene naftalate) suspension. This design maintains low resonance and, when compared to the titanium version, lowers the minimum crossover point value at 1000 Hz. The composite diaphragm assembly is made by an aluminum dome strongly joined to the PEN suspension, in order to assure unmatched transient response. The lower density of the aluminum and PEN structure permits higher levels of sensitivity, especially in the mid-high frequency range. A bended former edge-wound aluminum 75mm voice coil completes the diaphragm assembly. In comparison with a usual straight former joint, the ND3A moving assembly design assures extended frequency energy transfer for improved response linearity and unparallel reliability. 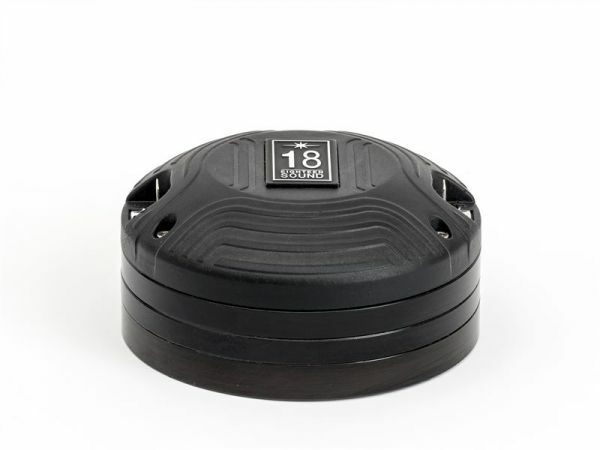 This feature facilitates proper motion control of the dome in real working conditions. A proprietary treated Nomex former is used as Nomex shows a 30% higher value of tensile elongation at a working operative temperature (200°C) when compared to Kapton. Moreover, this proprietary former material is also suitable for use in higher moisture content environments. Despite of its compact size, the ND3A neodymium magnet assembly has been designed to obtain 20KGauss in the gap for major benefits in transient response. The motor structure, throughout the precisely coherent metal alloy phase plug with 4 circumferential slots and copper ring on the pole piece, reduces inductance effect and distortion. Weiterführende Links zu "18s ND3A 8 Ohm"
Kundenbewertungen für "18s ND3A 8 Ohm"